The incredible scale and growth of China’s e-commerce market is not news to businesspeople familiar with the country. Driven by 772 million internet users, China spent over US$1.13 trillion on e-commerce purchases in 2017, accounting for about 40 percent of the global e-commerce market. Among the fastest growing subsectors of China’s e-commerce market is CBEC – the purchase of overseas products via e-commerce platforms. China’s CBEC sales hit the US$100 billion mark in 2017, and are expected to reach US$144 billion by 2021, according to data from eMarketer. CBEC is an attractive channel for foreign businesses to sell to China, as it allows them to access the world’s largest e-commerce market without the costs and commitment of establishing a formal presence there. However, overseas sellers often underestimate the difficulties posed by CBEC, which include a fluid regulatory environment, logistical headaches, and a lack of brand visibility, among others. Misunderstandings over how CBEC in China works frequently end in costly disappointments and retreats from the market despite its vast size and growth prospects. 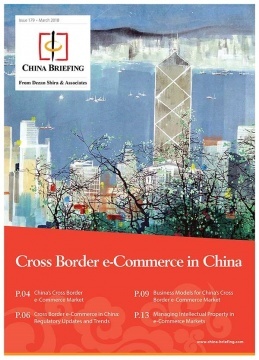 In this issue of China Briefing magazine, we offer foreign investors a practical guide to selling to China through CBEC. We begin by introducing the market landscape, before diving in to the sector’s legal and regulatory framework. We then compare the advantages and disadvantages of different CBEC business models. Finally, we consider how to protect intellectual property in China when selling online.